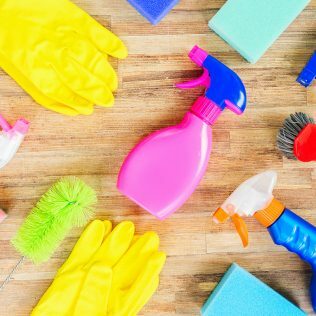 When Spring comes, many people get the cleaning bug. It starts with opening the windows to air out the house and goes on to include everything from cleaning out the closets and the pantry. When you get spring fever and want to start hauling junk to the dump, follow these easy steps to decide what stays and what goes, then haul all the things you don’t need away in a rental van or truck. The first step to your spring cleaning is to turn on the lights and open the blinds. Being able to see everything in good lighting is very important for deciding what you want to keep and what you can live without. Be ready to take a good look at everything you’ve collected over the last year. If you’re cleaning out the closets, you’ll want to start with three boxes to sort your items into: one to keep, one to donate, and one to throw away. When it comes to clothes, a good rule of thumb is to part with anything you haven’t worn in the last year. Throughout the year, you can turn hangers backwards after an item has been worn, so that later, when you want to clean out your closet, you can easily gather things you haven’t worn in a year. After, separate items you’re keeping from those you no longer need, you can organize what you’re keeping back into your closets. Next, it’s time to take a closer look at the items you’re getting rid of. Inspect items for issues like stains or rips. Most of the time, it’s better not to donate clothing items that have noticeable stains or other flaws. These can be thrown away. Anything that looks like it could be worn, should be donated to a charity like Goodwill or the Salvation Army. It not only cuts down on waste but helps provide jobs and affordable clothing for those in need. If you’re starting with cleaning out your pantry, begin by taking everything out. Then start checking your food items for best by and sell by dates. You can find lots of information online about items that last far beyond these dates, including pasta, canned goods, and rice. But anything that’s been opened or is long expired should be tossed out. Next, you can sort your remaining items into labeled bins and jars to make things easier to find in the cabinets, pantry, and fridge. Once you’ve purged your home of unnecessary items, you can haul it all to donation centers or a landfill. This could take you several trips in your own car, so it’s a great idea to rent a larger truck or moving van so that you can cut down on trips. A cargo van or a moving truck is the perfect way to cart off all your unwanted items after an extensive spring cleaning of your home. Check out our fleet when you’re ready to get rid of your donation and throw away boxes!